Do consumers prefer thin or thick tortilla chips? What’s more important in crackers — price or eating experience? And what do baked potato chip consumers think about whole-grain alternatives? 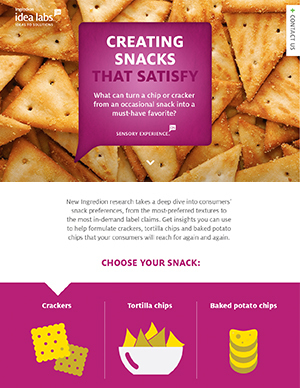 Find these answers and more in our new consumer insights brief and start making snacks that truly satisfy. The INGREDION and INGREDION IDEA LABS marks and logos are trademarks of the Ingredion group of companies.